I'm still mad as ever. I hope to post some more pictures soon to show you how mad I have been! Just another example of the ridiculous things I have to deal with. The humans are so disgusting I broke down and cleaned up after them! This is me wiping the kitchen counters off. Look at all of this mess! I've already told you... you'll get your baby back when you learn to bow in my presence. 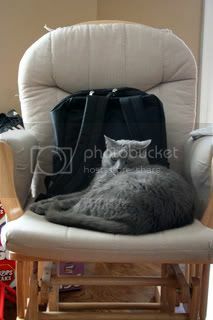 Gee, it sure would be nice if someone could remove this large backpack from my chair. Yes, I'm talking to you...the idiot with the camera. I normally would not stoop so low to ask you for a favor, but do you think you could possibly remove that idiot from my couch? Just because you think it is cute, doesn't mean I do. Now get it away from me. I am mad and here is where I tell you about it.